We woke up on Sunday morning to a downpour of rain. 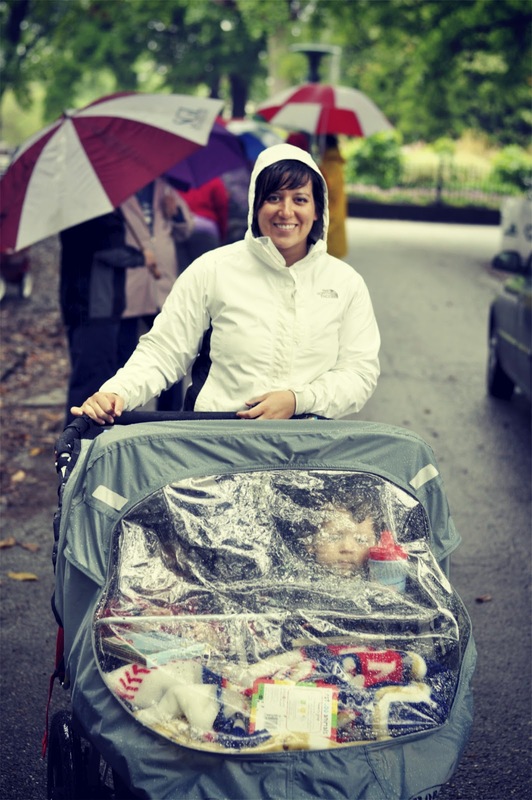 We knew that March for Babies is a rain or shine event so we dressed for the conditions as best we could, and tried to maintain our enthusiasm for walking five wet miles in 53 degree temperatures. In truth, it felt like a silly hardship to complain about compared to our NICU journey, and to what many babies face every day, just to live. One corner of Monroe park was bustling with walkers and sponsors, music blaring. We turned in our funds raised: $625.00! and took our place in line--we were one of the last groups to join the pack. The kids were snuggled in the BOB, protected by a rain cover and packed-in with plenty of books and snacks for the road. We found Roscoe's mini rainbow umbrella in the trunk of the car and it was good enough. It appeared that many walkers had decided to stay home and that, certainly, the babies and smaller children had been left to be warm and dry. Still, those who had shown up were in high spirits and never let on that the weather left something to be desired or that their shoes were already soaked through. In the crowd I caught glimpse of a banner held In Memory of some mother's baby. Within the first block Merritt was screeching to be released out of the stroller and so we stopped. Emergency vehicles charged with following up the rear were less than half a block behind us, so I lifted Merritt up and plopped him into the Ergo as we scrambled not to be caught in the very last position. The rain was steady and we tried to keep a decent pace to minimize exposing the kids to the elements. Our hope was that they would fall asleep en route, around 10:00, which is their nap time. The city was smoky with fog and drizzle. We walked quietly across the Manchester Bridge and I felt very small so high above the James river with its rushing water and ruins of industrial city landscapes. I held on tighter to Merritt. We turned down Semmes Avenue where traffic flow was reduced down to a wide sidewalk. I listened to two mothers exchange stories of their premature twins, and focused intently on the back of one mother who had pinned to her shirt a laminated collage of her babies Then, and Now as toddlers. We started across the Lee bridge and rain hit from new angles as the winds whipped everything up. I fondly remembered these winds from running the Richmond marathon in 2005. A newlywed in graduate school with "nothing to do" I had signed up with the training team the week we returned from our honeymoon, begging the coaches to let me run even though training had commenced a month earlier. My favorite training run incorporated this river, and this bridge. Our coach had warned us that on race day the winds would be tremendous and that our mental focus would need to be acute. I think it was around mile 16 or 17. I remember running the Lee bridge and gathering up in my mind all the longing and hope (and expectation) that I carried for one day becoming a mother. Fueled by joy and felicity I persevered through that wind to the other side and around the corner to pound through the miles that lay ahead of the finish line. I was 23 then, unaware of life's disappointments and struggles. That was before Grave's Disease. Before the depression. Before the separation. Before I felt a mother's love, and before Merritt's premature birth. Crossing the bridge on Sunday, Merritt was cold, his little eyes squinty and tired, his hair damp. Roscoe had fallen asleep. Andy and I were drenched and continued to walk in formation, only speaking to commiserate. As we reached the ramp off the bridge, we could hear pulsing beats from speakers at the finish line. We were close. As we re-entered the park I was approached by a woman who recognized us as having donated small toys and art supplies to the children's hospital for little ones with extended stays. I walked over to her tent and another volunteer gave me a hug and shared how much each donation means to the families who receive them. I broke down in tears. I had feared these tears but it felt good to let them out. She asked me to tell her my story. She had one too and turned to show a photo of her daughter who had been born at 28 weeks gestation and had suffered a brain hemorrhage that resulted in severe brain damage, handicaps, and learning disabilities. Her daughter died when she was seven years old. I told her how Merritt had been born at 33 weeks, and paraphrased the events because hearing her story made mine feel less traumatic. We hugged each other. I expressed my growing fear of having another premature baby, and of having to negotiate that experience again as a family. She shared that she went on to have two healthy pregnancies and two full term babies. I felt some relief for her and a little hope for us. Thank you so very much to everyone who generously donated to March for Babies on behalf of our little lion Merritt. You are awesome!